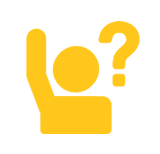 All Topics > Title Transfer > How To Remove a Lienholder from Vehicle Title? My vehicle was paid off a few years ago and the lienholder mailed me the pink slip. How do I remove their information (name and address) from my vehicle's title? The process of removing a lien holder from vehicle title is similar to that of performing a regular title transfer; such as when purchasing or selling a vehicle. 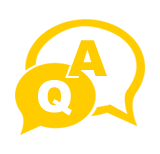 The main difference between removing a lienholder from title and transferring title to a private party, is that you the current owner, will act as both the seller and the buyer, and will sign in all spaces on your title transfer document(s), where required, as both the seller and buyer, i.e. Certificate of Title. With the lienholder's release signature (and stamp) on the title too, the DMV will remove them from your vehicle's record and issue you a new title without the lienholder information on it. The lien holder will then no longer have any legal rights to your vehicle. Please Note: When we mention "title transfer" on this page, we are referring to the process of removing a lienholder from a vehicle's Certificate of Title. For all practical purposes, the California Department of Motor Vehicles considers lien holder removals as title transfers. So you've paid off your loan (or otherwise satisfied your lien) and are now ready to remove lienholder information from your vehicle's title, and subsequently be issued a new Certificate of Title without your former lien holder's information. The process is fairly simply and straightforward, and the fee for doing so is $15.00 (at the time of this post). No smog inspection will be required and no Use Tax will be collected. During an ordinary title transfer, 4 year and older vehicles require a smog check, and Use Tax is collected based on purchase price. In the case of a lien holder removal, your transaction will be exempt from both of these requirements. For one, the vehicle isn't being bought, so there aren't any taxes to paid, and second, the vehicle is staying with the current owner (you), so no smog inspection will be required either. Normally all that is needed to perform a title transfer is the vehicle's original title and payment of title transfer fees to the DMV. With a lien holder removal, one additional document is required, and that is the REG 256 (Statement of Facts). Assuming you have your vehicle's title in hand, begin by signing the front of the title on Line 1a. This releases interest/ownership of the vehicle to the parties(s) named on the back of the title, which you'll be filling out next, as yourself. Complete the odometer information section on the front lower portion of the title, and sign as both the seller and buyer. Note, the odometer section does not need to be filled-in if your vehicle is 10 years or older. On the back of the title, where the buyer would normally write in their information, you will write in your information, just as it appears on the front of the title; unless you've moved to a new address, in which case you'd complete the back of the title with your updated information. Fill-in the back of the title with the new owner(s) information; which will be yourself, and a second party (if one exists). If you're adding a second owner, write-in their information on Line 3b, and pick the correct check box for AND or OR. If you check OR, either of you may sell the vehicle at any time without the other's signature. If you choose AND, both you and the second owner must sign the title when selling the vehicle. For line 9a (Purchase Price), write in 0, as in "zero dollars". Write in the purchase date on which you are performing the lien removal. You may use today's date. Also, on Line 11, write-in the word "NONE", as to identify no new lienholder exists. Next, you'll need to download and complete a REG 256 (Statement of Facts). You'll need a REG 256 in order to claim smog check exemption, and if adding a second owner (for the first time and for no consideration, i.e. no money, trade, or exchange for goods or service), Use Tax exemption as well. 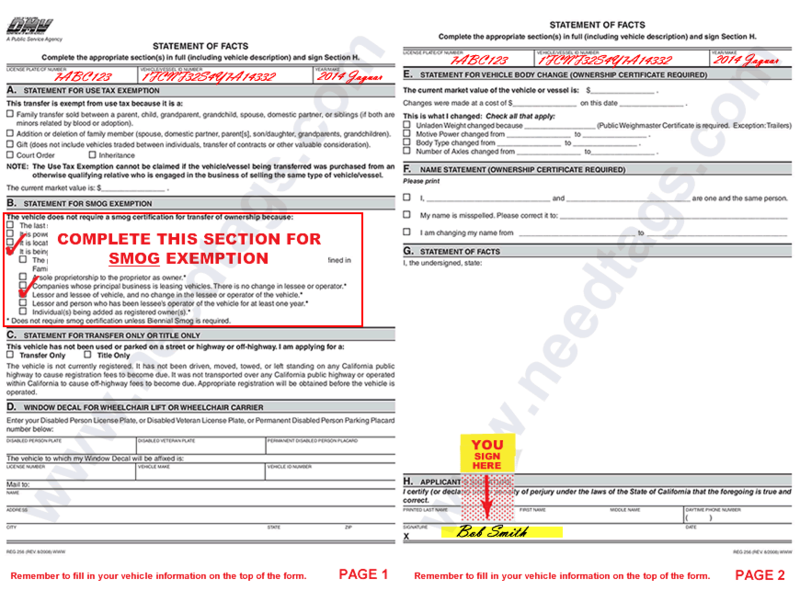 Complete section B of the Statement of Facts form (Statement for Smog Exemption), marking the transfer is occurring between the vehicle's lessor and lessee, and there is no change in the vehicle's lessee or operator. If adding a second owner, complete section A of the Statement of Facts form as well (Statement for Use Tax Exemption). Check mark whether the addition of the second owner falls under GIFT or Family Member. Sign page two of the REG 256. Ensure you write in your vehicle's license plate, vehicle identification number and year/make on the top of both pages 1 and 2 of the REG 256. You're all done with getting your paperwork in order. Now it's time to get your paperwork processed. You'll need to turn in your old Certificate of Title for a new one which will include your name and information only, and not your former lienholder's. You have two options to complete this transaction. 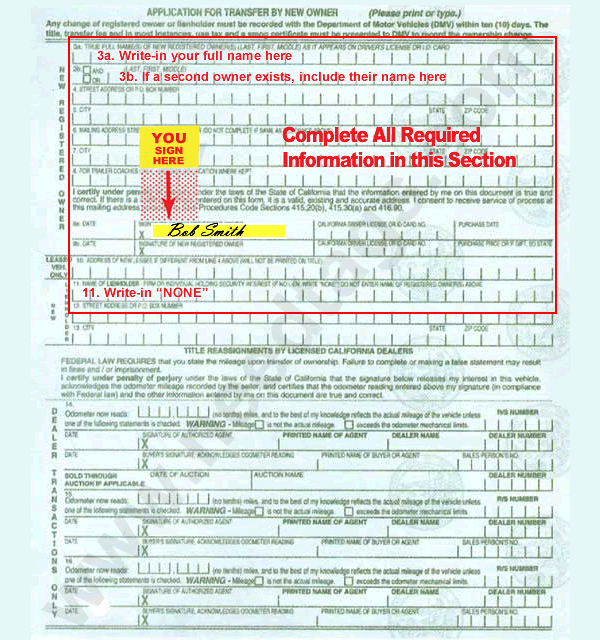 Once you're done, your new Certificate of Title will be mailed to you by the California Department of Motor Vehicles. Simply upload a copy of your documents (Certificate of Title and REG 256), mail-in your originals, and you're done. No need to visit the DMV and wait in long lines. NeedTags can process title lien removals for all types of vehicles including motorcycles, boats, RVs, ATVs and trailers. Option 2. In Person - You may turn in your documents either at a State of California DMV branch office or a privately owned local DMV service provider and pay fees there. 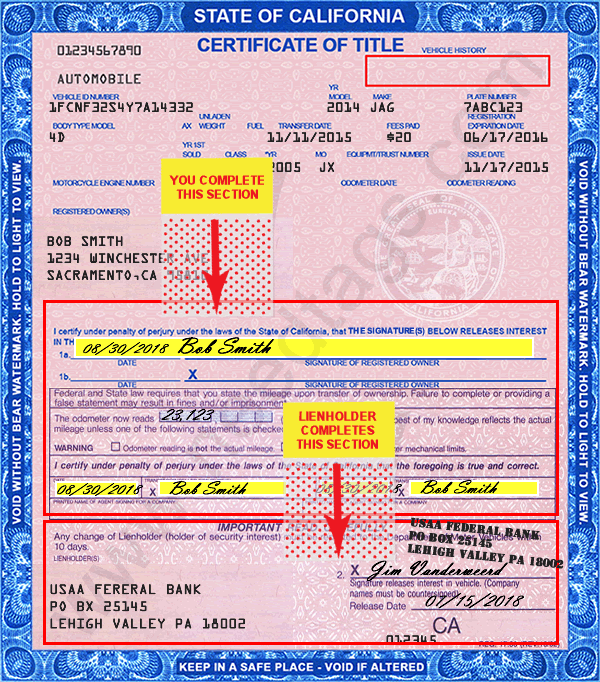 Visiting a local DMV service provider is a fast way to remove a lien from your title. These businesses are authorized by the California DMV to provide a full-range of DMV registration services quickly in-house. DMV service providers charge a nominal fee for processing, but often have little or no wait time. Is a Smog Check Necessary for Online Release of Liability?